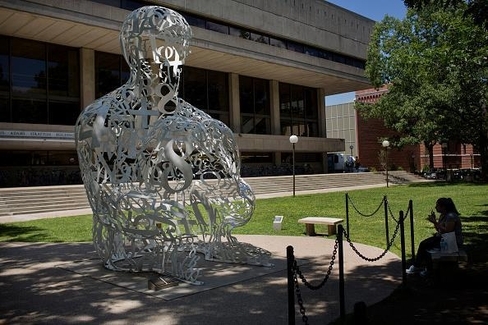 Jaume Plensa's 2010 sculpture "Alchemist" in front of the Stratton student center at MIT. The university was transformed with donations from philanthropist George Eastman. On the calendar this week was "Giving Tuesday," the informal start of the post-Thanksgiving charitable season, when many people make a particular point of donating to charity. Two-thirds of American households give money to charitable causes each year, and 63 million adults give of their time to charities as unpaid volunteers. If you're in either camp (they overlap significantly), you probably don't need a Chinese aphorism to tell you that charity blesses those who give as well as those who get. Researchers have found notable correlations between charitable giving and happiness. For instance, data from the 2001 Social Capital Community Benchmark Survey, a major source of information on civic activity, indicates that people who donate to charity were 43 percent more likely to say they are "very happy" than nongivers, while nongivers are more than three times as likely to say they were "not happy at all." America's philanthropic culture has amazed foreign observers for generations. In the 1830s, Alexis de Tocqueville famously marveled at Americans' "innumerable multitude" of charitable endeavors: "The Americans make associations to give entertainments, to found seminaries, to build inns, to construct churches, to diffuse books, to send missionaries," he wrote. Eighteen decades later, the German-born British journalist Matt Frei expressed similar astonishment: "Americans give to schools, hospitals, libraries, galleries, and the poor like no other country in the world," he noted with awe on BBC. "Americans, wealthy and not so wealthy, are giving their dollars away by the lorry load." There are some who argue that most of this giving doesn't really count as charity since it isn't dedicated to the relief of the poor and sick. Peter Singer, a well-known professor of bioethics at Princeton, disdains those who give money to orchestras and museums when so many people still suffer from hunger and disease. Former NPR executive Ken Stern laments that charitable status is granted so promiscuously — not just to groups that help "the poor and downtrodden," but also to "organizations that have little connection to common notions of doing good: the Sugar Bowl, the US Golf Association, the Renegade Roller Derby team . . . and the All Colorado Beer Festival." Clearly there are better and worse ways to donate one's money and time; and clearly those who help the poor, sick, and hungry should be praised and emulated. But I think Karl Zinsmeister, editor of the Almanac of American Philanthropy, makes a better argument. I'm a fan of Zinsmeister's work, which I've cited in the past. I return to it today because he persuasively refutes the idea that only generosity aimed directly at the poor should count as philanthropic. That attitude, he writes in the lyrical introduction to the almanac's 2017 edition, "is astoundingly narrow and shortsighted." For starters, he notes, direct aid is only one way to help the poor. He cites the example of George Eastman, founder of the Eastman Kodak photography company, who donated tens of millions of dollars to higher education, transforming the University of Rochester and MIT into top-tier research institutions and sustaining Tuskegee, Hampton, and other historically black colleges for decades. In so doing, he contributed to the knowledge, prosperity, and advancement of tens of thousands of individuals across the social spectrum — and through them and their achievements, to the welfare of millions of human beings. Viewed in that light, is donating money to a college really less valuable than giving to a soup kitchen or homeless shelter? American philanthropy comes in more varieties, supports more ventures, and has done more good than the most industrious team of researchers could ever fully tally. "The wild richness of American philanthropy," as Zinsmeister calls it, is exhilarating. Historic treasures like Mount Vernon and Monticello; houses of worship from the tiniest neighborhood churches to the National Cathedral; innumerable public libraries; vast swaths of Acadia, Grand Teton, and other national parks; great astronomical observatories; cutting-edge medical facilities; art museums and orchestras — all them of them thrive today thanks to the benevolence of legions of charitable donors. Entire scientific disciplines, such as oceanography and biomedical engineering, have been brought into existence through visionary philanthropy. And without philanthropy, some of the nation's most enlightened causes, like the temperance movement and the preservation of endangered species, would never have gotten off the ground. American philanthropy comes in more varieties, supports more ventures, and has done more good than the most industrious team of researchers could ever fully tally. Yes, some charities are of dubious worth. But taken as a whole, private giving in America has been one of history's greatest engines of progress, kindness, and uplift. Be a part of it. Give.